The subject matter of documentary photography has infinite possibilities; disasters and poverty are not its only objective, yet one of the most prevalent. While it might not convey the entire story, documentary photographers are able to influence the public and broaden the viewer’s experience by showing unseen aspects of society. Furthermore, photographers share the belief that a photograph can disclose information in the most faithful way. But what is the real effect of these depictions? What is the effect of taking and showing the pictures of war, corpses, torn bodies or any kinds of violence against humanity? From my point of view, documentarians aspire to represent relative truth to the best of their ability and their pictures have managed to affect people’s attitudes. The focus of the essay will be on the influence of agony in photographs. I would like to investigate whether the brutality of war could be diminished for viewers by seeing pictures of war, whether depicting the pain of others is unethical and ineffective. Is it moral for the photographers to take or even to show these so called sorrowful pictures? Isn’t it their duty to record every aspect of our lives? To test this boundary, I will analyze some samples of war pictures taken by documentary photographers such as Christopher Morris, Lana Slezic, Louie Palu and Nina Berman. The twentieth century was a golden age for photojournalism. Photographers were able to use small portable cameras and more light sensitive films as a result of the technology that was developing rapidly through scientific revolution. Consequently, photographers could approach battlefields to capture impressive shots. Photographically illustrated magazines were in high demand and people were experiencing a novel approach to war through those photos. Ritchin (1988) describes: “ For the reader, the experience of being exposed to such life-like representations of events one had never seen could be intense.” Photography allowed people to experience what was going on beyond their restricted routines such that they eventually learned not only by reading, but also by exploring these photo-essays. Magazines were claiming that they were going to represent the truth about the world. Panzer (2008) writes: “… Capa told the writer John Hersey that a “great picture” could be “cut of the whole event [so that it] will show more of the real truth of the affair to someone who was not there than the whole scene. When Capa rushed pictures of Omaha Beach back to Life's London office, he was bringing “real truth” to an audience that had no other way to see it.” It has gradually become common for newspapers to publish war photographs; earlier it would have been restrained, as it was perceived as too shocking. Source: (Figure1), Nina Berman, Marine Wedding, 2006. These pictures make us eager to listen. They speak powerfully, as only pictures can, for themselves. How will history remember Ty Ziegel ’s wedding pictures? The intensity of these pictures is undeniable. However diverse the viewers’ political opinions, the images are a bleak and complicated anti-war statement. The groom's obscure look is a metaphor for the all the ways that war alters people’s life. Sontag (2003) writes: “Harrowing photographs do not inevitably lose their power to shock. But they are not much help if the task is to understand. Narratives can make us understand. Photographs do something else: they haunt us.” No wonder the viewer is shocked by looking at Berman’s photos, facing this sad truth is so hard that one may not immediately determine if the wedding is real or not. Although one manages to recover from the initial shock eventually, bitterness of this reality does not fade away easily. Awakening sleeping hearts, shaking up the brain, and encouraging viewers to think about possible problems are what an impressive documentary can do. It would be difficult to remain calm and insensible when viewing one. 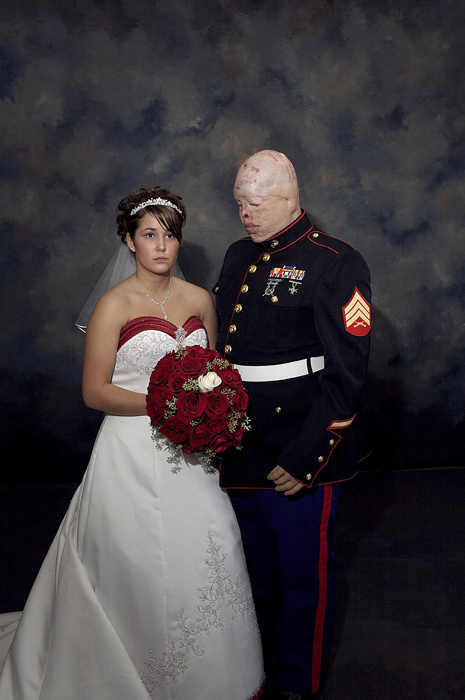 By seeing these pictures one remembers how deep war terrors can be, and how it can ruin our body and soul. The project on Afghan Women by Lana Slezic is an impressive investigation to capture the truth. In this project, Slezic concentrated on the women of a country at war. 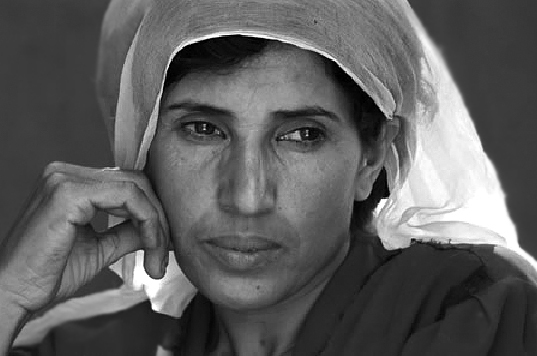 While on most occasions, the international media might claim that the liberation of Afghani women and the process of democracy in Afghanistan has been advanced, Slezic claims that in fact little has changed and that Afghani women, specifically in rural areas, are still subject to forced marriages and abuse; many are not allowed to leave their houses without a male companion. Afghani women’s pictures show the tragedy of their wretchedness and oppression. Admittedly these illustrations help viewers to understand their situation. 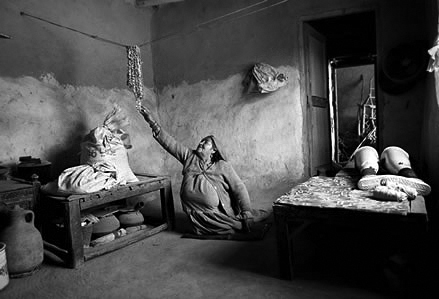 Source: (Figure 2), Lana Slezic, Afghan Women, Afghanistan, 2007. Source: (Figure 3), Lana Slezic, Afghan Women, Afghanistan, 2007. This shocking picture of a twenty year-old Afghani woman, Zahra, tells the story of self immolation in Herat province which is a fairly common method of suicide attempt among women (Figure.3). There are still a huge number of landmines which have been left behind from the fighting between the Taliban and Mujahideen in the region. Sabza Gul lost both her legs when she stepped on a landmine in a small village near Bagram (Figure.4). 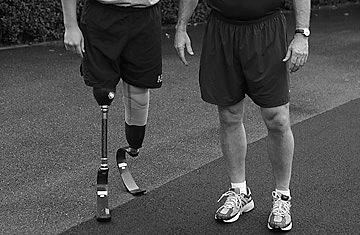 The desire to live and keeping up with daily house chores, even without using artificial legs, demonstrate the integrity of human desires to fight against calamities. Seeing these kinds of pictures moves viewers, as they encourage us to think about how significant it is to confront these disasters. Source: (Figure 4), Lana Slezic, Afghan Women, Afghanistan, 2007. Source: (Figure 5), Christopher Morris, Americans, 2012. 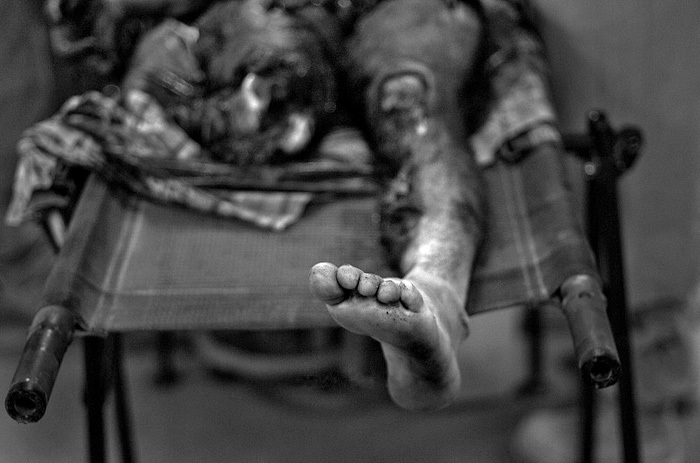 This picture, from the series of Afghanistan: The Fighting Season, taken by Palu, is undeniably a shot for the record to illustrate the brutality of war: the shredded and removed leg of an Afghani civilian security guard after stepping on a landmine planted by rebels (Figure.6). Although seeing this kind of photographs is excessively irritating, its capability of indicating the depiction of war is not comparable with any narration. Sontag (2003) indicates: “Photographs of the suffering and martyrdom of a people are more than reminders of death, of failure, of victimization. They invoke the miracle of survival.” The intelligible justification for recording these pictures is its duty to the discipline of documentation: to be regarded as historical evidence. Although historians, as always, write and archive history, a visual document leaves a very efficient and stirring impression. In fact, because of the unique abilities of the camera, photographers are able to record the truth, make it everlasting, and provide us the opportunity to dig into history, to investigate it, and to learn about the past. Source: (Figure6), Louie Palu, Afghanistan: The Fighting Season, 2009. 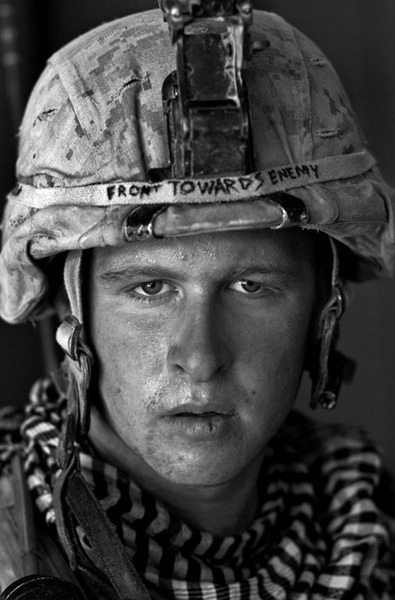 Source: (Figure 7) Louie Palu, Afghanistan: The Fighting Season, 2009. Source: (Figure 8) Richard Johnson, Portraits of War, 2003. On one hand it is painful to look at these representations as they are not pleasant. On the other hand our curiosity to learn about the event persuades us to explore them entirely. The photographs of misery have a dual modality. Human beings have innumerable range of characteristics and features. Some are inherent, some are formed through experiences and some are developed through wisdom and insight. One of the most fundamental of these human features is that of curiosity. Humans are naturally inquisitive and their curiosity is rooted in their never-ending desire to ask, explore, investigate and learn. As this emotion represents a drive to know new things, curiosity is a major driving force behind scientific research and other disciplines of human study. In fact, in its development as amazement and admiration, it is generally curiosity that makes a person want to become an expert in a field of knowledge. I suggest that individuals are interested in observing visual components, in this case photographs, to investigate the truth according to their curiosity. To conclude, during the history of photography, the camera gained acceptance as a powerful tool and the photograph became a reliable and accurate visual reporter for almost every purpose. Therefore, documentary photographers were able to influence the public. Even though illustrating tortures and pains of others is neither pleasant nor easy–whether one pictures them or one merely looks upon them–it is essential to record any significant event around the world, in order to make the invisible visible. These pictures are able to influence people’s attitudes and they can become a powerful weapon for social improvement. Thus, even with the narrow possibility of a neutral reaction, publishing these photographs is still imperative. The nature of man’s curiosity has made him reflect upon higher purposes and discover deeper meanings in things, going beyond what these apparently seem to be. By exploring photo-essays an individual can discover the truth visually. This is why photographs taken from wars, prisoners, torn bodies of so-called misery photographs are inexorably prominent. Even though we merely see what the photographer has presented for us to see and suffering is viewed third hand, this is no less common in other kinds of art such as literature. Sontag is hardly in good faith when she notes: “It is always the image that someone chose; to photograph is to frame, and to frame is to exclude” But this is exactly what a writer does, picking the right words to narrate a story and what we read is actually a framed version of the writer’s original opinions. As one reads tragic writings about unfortunate events happening all around the world and one is undoubtedly affected by them, one could learn from misery photographs as well as one is affected by them. Berman, Morris, Palu and Slezic all use their cameras to demonstrate a challenging topic. Their depictions give us a close shot of the layered brutality of war. I suggest that revealing the viciousness of any kinds of violence against humanity is extremely important. Depiction of the pain of others can raise social consciousness to react against atrocity. Though I have been critical of Sontag at times, she does rightly say: “Making suffering loom larger, by globalizing it, may spur people to feel they ought to ‘care’ more.” Still, she seems not to run a risk, by continuing: “It also invites them to feel that the sufferings and misfortunes are too vast, to irrevocable, to epic to be much changed by any local political intervention.” The impact of photographs is highly important since it is imprinted on our minds. Here, Sontag writes: “The pictures will not go away.” For this reason, I would maintain that it doesn't matter if we write or we prefer to take pictures, we should be able to talk about the truth as loudly as we can, in the hopes that some will care. 1. Fred Ritchin, “Close Witness: The Involvement of the Photojournalist” A New History of Photography, Michel Frizot, (Konemann, 1988), 593. 2. Mary Panzer, “Iraq War Veterans.” (Aperture,191, Summer, 2008),76-81. 3. John Berger, “Photographs of Agony.”About Looking, (Pantheon Books, 1980), 39. 4. Mary Panzer,“Iraq War Veterans.” Aperture, 191, Summer, 2008. 5. Susan Sontag, Regarding the Pain of Others, (New York: Farrar, Straus and Giroux, 2003), 89. 6. Susan Sontag, Regarding the Pain of Others, (New York: Farrar, Straus and Giroux, 2003), 89. Selected Writing, 1975-2001. (Cambridge, Massachusetts & London: The MIT Press, 2004), 189. 8. Lana Slezic, " lanaslezic.com. ", Last modified 2006, http://www.lanaslezic.com. 9. Susan Sontag, On Photography. (New York: Farrar, Straus and Giroux, 2001), 23. 10. Mary Panzer, “Iraq War Veterans.” Aperture,191, Summer, 2008. 12. Susan Sontag, Regarding the Pain of Others, (New York: Farrar, Straus and Giroux, 2003), 87. 14. Susan Sontag, Regarding the Pain of Others, (New York: Farrar, Straus and Giroux, 2003), 22. 15. Susan Sontag, On Photography. (New York: Farrar, Straus and Giroux, 2001), 6. 16. Susan Sontag, Regarding the Pain of Others, (New York: Farrar, Straus and Giroux, 2003), 46. 17. Susan Sontag, Regarding the Pain of Others, (New York: Farrar, Straus and Giroux, 2003), 22. 19. Susan Sontag, “Reading the Torture of Others.” In Susan Sontag: At the Same Time, Essays and Speeches. (New York: Farrar, Straus and Giroux, 2007),130. Berger, John. “Photographs of Agony.” About Looking, No.191, Pantheon Books, 1980, 37-40.
modified 5,24,2010. Accessed April 15, 2012, http://www.vqronline.org . Newhall, Beaumont. The History of Photography. New York: The Museum of Modern Art,1982. Panzer, Mary. “Iraq War Veterans.” Aperture, No.191, Summer, 2008. Photography, Michel Frizot, 593, Konemann, 1988. The MIT Press, 151-206, 2004. Slezic, Lana. " lanaslezic.com. ", Last modified 2006, http://www.lanaslezic.com. Sontag, Susan. On Photography. New York: New York: Farrar, Straus and Giroux, 2001. Essays and Speeches. New York: Farrar, Straus and Giroux, 2007, 128-142.